A CobraCountry visitor (and FIA-accredited vehicle aerodynamics diagnostician) in Henderson, Nevada apprised us of this eminently affordable replacement PRS set that can seriously improve the performance and the lifespan of your Cobra or GT40’s Ford engine. Parts sets are (at the time of this writing) available for nearly all Ford V8 engines, including all the small-block and big-block (FE Series and 385 Series), the current exceptions being flathead V-8s from 1932 to 1938, and the 221 cid and 260 cid high-nickel–content small-block V8s of the early ’60s. 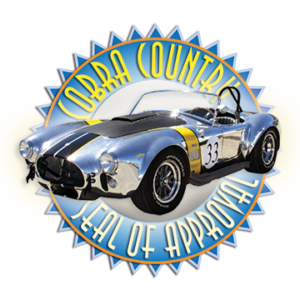 When we get some more (favorable) feedback from our visitors, we’ll seriously consider awarding this product our Cobra Country Seal of Approval (which you can see waiting-in-the-wings below. Sidewinder Tip#1: you can instantly find/return to this ‘PRS Replacement Set’ page by just using Sidewinder : for example, type <PRS> or even <performance booster> into the ‘Sidewinder’ search box.